Actress and model Heather Locklear have married twice and both time her wedded life has not been successful and got divorced. Heather Locklear is an American actress and mode well-known for appearing on the TV series, Melrose Place as Amanda Woodward. Her personal life is full of ups and downs. She has been married twice till now but both of her relationships did not work out, and she got divorced. Is she dating someone currently? Who is her boyfriend? Let’s discuss more of her personal life here!!! The couple first met at an REO Speedwagon concert in 1985 and began dating afterward. 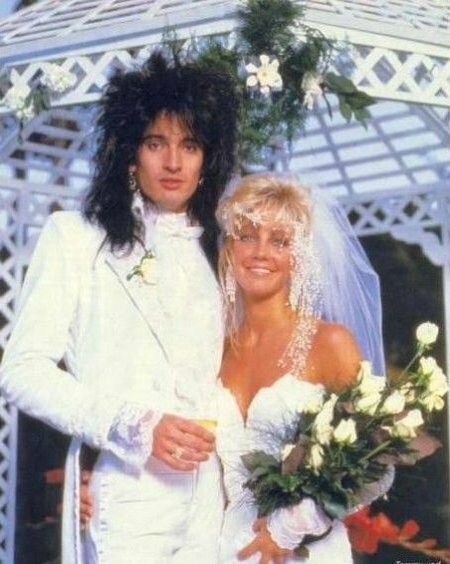 She tied the knot to drummer Tommy Lee on May 10, 1986. The ceremony was held at Santa Barbara Biltmore Hotel in California. The newlywed wore a mermaid style dress while the groom had a white tailcoat and knee-high boots. The lovable pair went for a three-week honeymoon in the Cayman Islands. After the divorce with her first partner, she married Bon Jovi guitarist Richie Sambora on December 17, 1994, in Paris. The newlywed seemed very happy together. The couple was also blessed with a beautiful daughter named Ava Elizabeth Sambora on October 4, 1997, who is in a modeling sector. However, in February 2006, Locklear filed for a divorce but the divorce was finalized on April 11, 2007. Although, they had separated but they were seen together in Hawaii. It was shocking to all of us when we saw Heather enjoying her vacation time with her ex-husband Richie whom she divorced eight years earlier. Everyone started to assume that might have got back together. The former couple was also spotted going for a walk on the beach in Kona, Hawaii. They were also seen together at their daughter Ava's 16th birthday on October 4, 2013. However, they told the sources that they were just hanging out and there was nothing serious going on between them. Currently, she is dating with Beverly Hills plastic surgeon Dr. Marc Mani. After a split with Jack Wagner, she has been dating to Dr. Marc, who is eight years younger than the former “Melrose Place” star. Even though she was linked up with many men before including Jack Wagner it looks like she has finally found the right one for him. We wish the couple to have a bright future ahead and wants them to start a family as soon as possible.